* NCS recommends shipping by USPS Media Mail for the most economical stateside shipping cost. To choose Media Mail, click on the US Postal Link below the UPS shipping options during the checkout process. 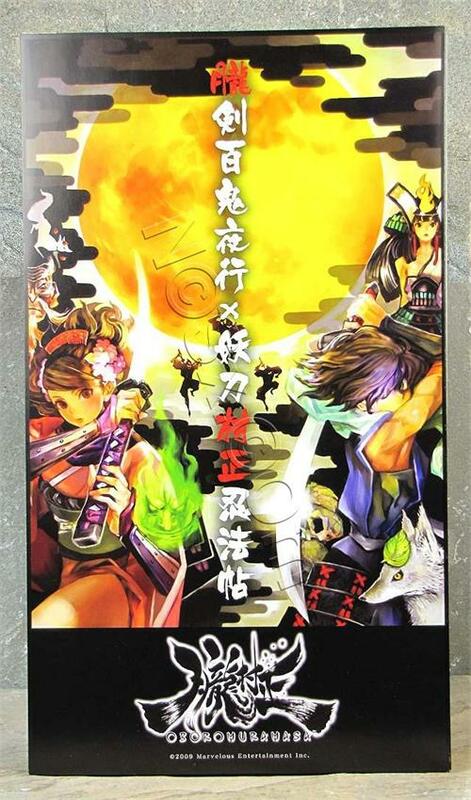 «©NCSX» Brand new and factory sealed Oboro Muramasa Fanfold Poster which was only released in Japan as an official bonus to be included with the Oboro Muramasa game for the Wii. NCS was able to purchase surplus inventory from vendors in Japan which we are offering for general sale. The poster measures 38 x 21.59cm or roughly 15.00 x 8.50" in area. The front of the poster mirrors the image found on the cover of the Japanese Wii game and features the heroes Momohime and Kisuke with weapons drawn. The "fanfold" in the product title refers to the fact that the poster unfolds into seven additional pages. Once unfurled, the total of eight pages create a mural-like effect for a massive display of Oboro Muramasa artwork that'll cover a wall or table area with 68" of wingspan. The front pages feature the good guys and supporting characters from the game while the flipside of the pages contain the entire assemblage of enemies and bosses from Muramasa. The later pages from the flipside includes smaller images of the heroes and supporting characters along with 24 screenshots taken from the stages in the game. Brand new and factory sealed Bayonetta Rodin's Selection Japan Bonus Soundtrack Package which was only released in Japan as a bonus to be included with the Bayonetta game for PS3 and Xbox 360. Brand new and factory sealed End of Eternity Special Soundtrack Resonance of Sounds CD which was only released in Japan as a bonus to be included with the End of Eternity game for PS3 and Xbox 360. Brand new and factory sealed Senjou no Valkyria 2 JPN Document of Gallia 1936 Bonus Package which was only released in Japan as a bonus to be included with the Senjou no Valkyria 2 game. I bought one of these but I'm also looking for the vinyl Muramasa poster. Any chance of those any time soon?